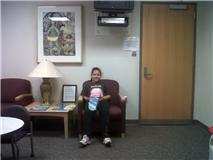 Today we had out first PT appointment at the UNC Children Hospital. It was nice to say not blood work. This is the first time we have been to that hospital and gotten out within a hour, no blood work, no tests. So Catherine is starting her PT routine 3 times a week. They put a lift in her shoe to even out her legs, the right is longer than the left, and it makes her balance uneven. We will see!